SPIED: G80 BMW M3 - 3.0L inline-six, 480 hp, AWD? 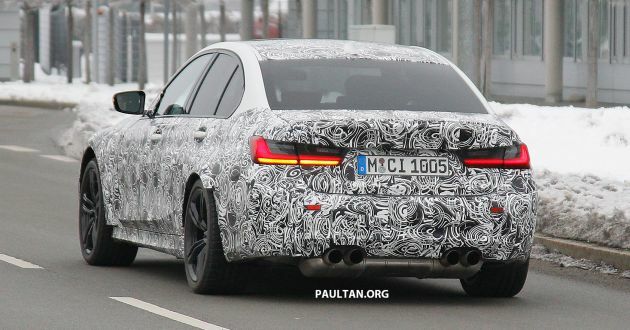 Home » Cars » SPIED: G80 BMW M3 – 3.0L inline-six, 480 hp, AWD? SPIED: G80 BMW M3 – 3.0L inline-six, 480 hp, AWD? 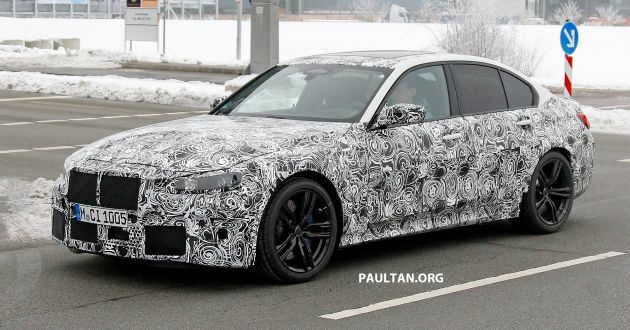 The new G80 BMW M3 has been spotted out in the open again, ahead of its debut this September at the Frankfurt Motor Show alongside its two-door sibling, the M4. While fully camouflaged, this prototype sports the typical widebody M look, as clearly seen with the flared wheel arches. Not much can be made out from the front, but a quick glance from behind reveals the quad exhaust tips, which is a typical trait of the M3. However, unlike the outgoing F80 M3, the next-generation model will be available in a number of offerings, including the possibility of an all-wheel drive variant. Heresy, you say? Well, not quite. But first, let’s address the powertrain in question. At launch, the G80 M3 is expected to use the new S58 3.0 litre twin-turbo straight-six petrol engine, featuring the high-tech water injection system first seen in the existing M4 GTS. The same engine – 55 hp and 50 Nm more than the S55 3.0 litre engine – powers the newly-launched X3 M and X4 M. Output is said to be as high as 480 hp, although sources say a ‘milder’, stripped-out 460-hp variant could supplement the line-up. For driveline, the ‘base’ M3 (internally known as the M3/M4 Pure) may be had with a six-speed manual transmission, with drive exclusively sent to the rear wheels. Meanwhile, the AWD M3 with a rear-biased M xDrive system could get an eight-speed automatic transmission. Meanwhile, reports say there’s no plans for an M3 Touring. A source from BMW M said that in 2020, the M model range will include the M4 Gran Coupe, which may pose as the indirect successor to the M3 Touring. For now, the latest G20 3 Series with the most potent punch is the M340i xDrive, packing a 3.0 litre turbo inline-six with 374 hp and 500 Nm of torque. It does the century sprint in 4.4 seconds. The four-pot 330i produces 258 hp and 400 Nm of torque, and does the 0-100 km/h in 5.8 seconds. Amazing how the Germans work hard and just continue to improve themselves. 480 Bhp from a 3.0 is amazing achievement. I heard when BMW launches a car, the BMW engineers and designers the next day itself is already working on the next generation car 7 years time. This is what you call hard work. Not launch today and relax for the next 7 years goyang kaki in opis. BMW Malaysia and MBM sales people are to scared to tell you this during the sales pitch. In overseas countries, under their consumer laws, it is an offence not to tell the consumer such a CONDITION of a contract. 750k for 480hp only, not as good value as Civic 1.5T 120k only. 750k for amoled touch screen BMW smart keyless entry key fob, 120k civic 1.5 only generic Honda keyless fob. Previous Post: PANDU UJI: Ford Ranger Raptor – adakah prestasi tinggi dan ketangkasannya sepadan dengan harga?